Season chops to taste with salt, pepper and chopped fresh rosemary. Heat 1 Tbl. oil in a large sauté pan on medium high heat. Place chops one by one in hot oil for about one minute per side or until seared and caramelized on all sides. Add more oil as necessary. Remove and set aside. In a 2-gallon pot, heat olive oil and add carrot, celery and onion. Sauté until tender, about 10 minutes at medium heat. Add the broth and the rest of the ingredients but reserve juice of one lime for later. Bring broth to a boil. Reduce to a simmer for 10 minutes. Reserve. Mix all ingredients together and knead for 10 minutes then place in a large bowl and cover with Saran Wrap and refrigerate overnight. Otherwise, at least 3 hours of refrigeration is needed. Remove the bowl from the refrigerator. Split the mixture into four parts and make four balls. Make a hole in each ball large enough for 2 lamb chops in each one. Seal the ball around each pair of chops so that the bones extend outside of the ball. Transfer broth into a 6 gallon pot and bring to a simmer. Add juice of one lime. Gently place meatballs in the hot broth. Stabilize balls with lamb bones facing up and out of the broth. Cook on a very low flame for about an hour. It is quite dramatic to present the meatballs tableside and carve and serve at the table. To do so, place the meatballs on a large warmed platter lined with parsley sprigs. Bring the broth, in a tureen, to the table. Slice each meatball in half with a serrated knife. Place round side up in a 12-inch plate. Ladle a cup and a half of broth over each half and sprinkle with a spoon of chopped parsley. Same procedure can be done in the kitchen without tableside presentation. 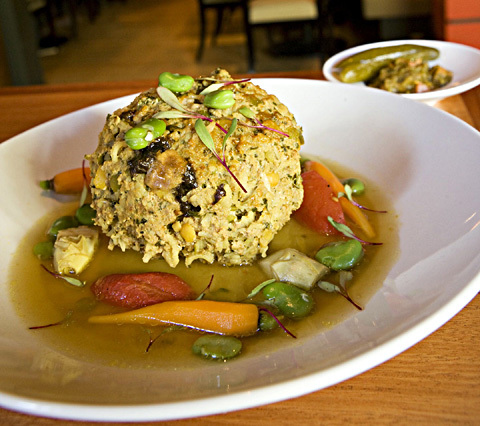 *This extra large meatball is a popular celebratory Iranian dish.